In the name of “progress”, women can no longer join the Green Party’s youth or feminist wings. If you are a member of those political party groups and happen to have two X chromosomes, you will henceforth be know as a ‘non-male’, Green Party Women and Young Greens have announced. Female members first learnt of their new status when Young Greens tweeted last month: “…non-men who are Young Greens can find and join our Facebook group ‘Young Greens Women’”. The idea was that it would be more “inclusive” to the confused, the transgendered and ‘non-binary’ people to stop referring to women all together. ‘Non-binary’, for the uninitiated, is a politically correct term for someone who does not consider themselves a man or a woman. However, many prominent feminists were annoyed. They argued that it was absurd to “erase” women from a women’s movement just because biological men who consider themselves women (or somewhere in between) might get offended. Others, meanwhile, simply seized the opportunity to make a few jokes under the #greenpartyfeminism Twitter hashtag. Chaka Khan’s hit became, “I’m Every Non-Man”, and Bob Marley’s lyrics became, “No Non-Man, No Cry”. Blur’s ‘Boys and Girls’ lyrics became: “Non-boys who are boys, Who like boys to be non-boys, Who do boys like they’re non-boys, Who do non-boys like they’re boys”, and so on. Undeterred, Young Greens doubled down, responding: “Thanks to those who have offered constructive thoughts on the language we use! We currently use ‘non-male’ because this is inclusive other non-binary genders which have a place in our group”. 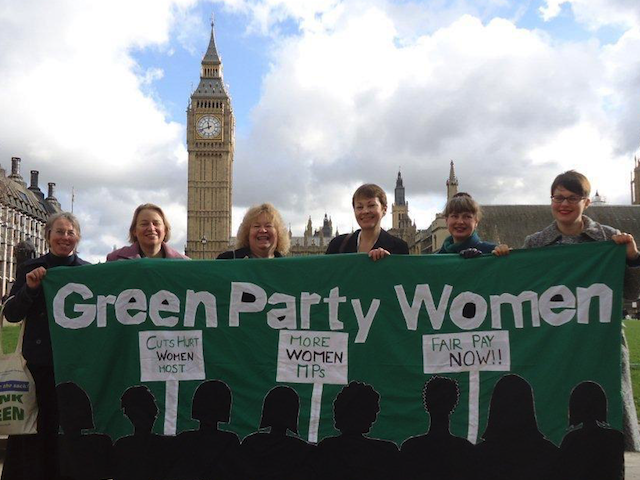 The Green Party Women group, the adult feminist faction of the party, waded in at the beginning of this month. They released a statement on Facebook in support of Young Greens, before deleting it and releasing another one. “Green Party Women are happy with uses of the term ‘non-male’ as an umbrella term when gender balance practices are conducted. “Language is all-important. It was never the intention of the Young Green Women to use the term ‘non-male’ to describe women, and this has now been clarified. This is not the first time the far-left party has descended into internal conflict over transgender issues. There were calls for their Cambridge parliamentary candidate, Rupert Read, to step down last year when he said the insistence on calling all non-transgendered people “cisgender” “troubled” him. He also argued that, different from people who are born with female anatomy, Transgender women were, “a sort of ‘opt-in’ version of what it is to be a woman”. He was called a “bigot” and “transphobic”.